We have shared a wonderful day together. It’s almost been like an Ecumenical Camino. We have spent the whole day going from venue to venue – from Lutheran Church to Catholic Church to public venues in an ecumenical walk commemorating the Reformation of 500 years ago this day. I would like to offer three simple words to bring our day together. The first word is ‘Repentance’. All of us should be very repentant for what has taken place over the last 500 years. We hear afresh the intimate prayers of Jesus on the night before he died in John 17:21…. “That they all might be won. As you, Father are in me and I am in you, may they also be in us, so that the world may believe that you have sent me”. We repent because this heartfelt prayer of Jesus to the Father at the most vulnerable moment of His life has not been lived out in the last 500 years amongst us. Not that any of us are necessarily personally culpable for the past. But we are collectively responsible for the future. We saw today the terrible way we treated each other in the years following the beginning of the Reformation. The way we used polemical characters and cartoons that demeaned each other and were insulting of the integrity of each other and our communities. Please God, those days are completely and totally finished. However, we can only hope that using stereotypical language that demean and insult each other is not used in our world today especially in regard to Roman Catholics and Lutherans. With remorse and a strong determination to amend our ways, therefore I ask you most sincerely dear Bishop John Henderson, Bishop Head of the Lutheran Church of Australia and New Zealand to forgive us for any time Roman Catholics have hurt your community in Australia over the years with language or caricatures that are not worthy of the Gospel. I ask your forgiveness as the Chairman of the Catholic Bishops’ Commission for Ecumenism and Interreligious Relations here in Australia with sincerity and humility. At the same time, there is a firm resolve of living out communio with each other as far as we possibly can in the years ahead with renewed conviction. The second word I would like to use is the word ‘Thanks’. We thank the Lord for particularly the last few decades of incredible reconciliation between our two communities. Our thanks particularly go to the impulse of the Holy Spirit. 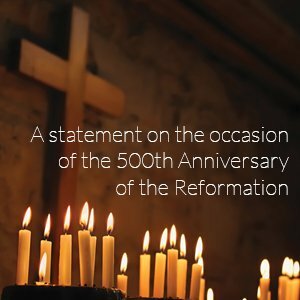 In the midst of our fractured and feeble attempts, the Holy Spirt has come to us and is forging unprecedented bonds between Lutherans and Roman Catholics throughout the world and especially here in Australia and New Zealand. We see this impulse particularly, from the Catholic point of view, in the Vatican II Council documents which gave such a great openness to Ecumenism. These documents were prophetic and paved the way to understand the implications of communio amongst us. We also see the presence of the Holy Spirit with the bringing together of the different disparate communities of the Lutheran Church here in Australia over these years. We learnt today particularly of the 120 years of the division of the Lutheran Church in Australia. But then we heard how different Synods or communities have come together in the one Lutheran Church of Australia as it was born in October 1966. Internationally, we also recognise with great thanks to God the landmark document of the “Joint Declaration on the Doctrine of Justification” which was signed on this very day in 1999. This international document was signed from the Catholic point of view by our own Australian Cardinal Cassidy, who lives in retirement now in coastal New South Wales. It has become a living document that continues to draw us together and not only the Roman Catholics and the Lutherans! I am very much aware that the Anglicans have been very much touched by this document too. In this regard, I am delighted to see amongst us today my dear friend Bishop Philip Huggins, the current President of the National Council for Churches Australia (NCCA) and the Executive Secretary Sr Elizabeth Delaney. Perhaps our visible unity shown on this day is sending out a very good example to all Christian denominations in this land that unity is a great missionary priority and urgent task in these days. On the local level nationally we thank the Lord too for the extraordinary work that has been done over the last 42 years by our National Lutheran and Roman Catholic Theological Dialogue Group. They produced eight fabulous documents and a ninth one is in present gestation. All of this profound theological reflection has been done for the service of the Church. I wish to pay tribute to all those various members that have contributed over the 42 years to this wonderful dialogue. Some are here today but others have retired and others have even gone to God. We pray that these inspirational documents have an ongoing reception in the new generation that is now upon us. The third word I’d like to mention is the word ‘Hope’. We have great hope for the future. We’ve just learnt in a previous session about the importance of a new theological methodology called ‘Receptive Ecumenism’. It is here that we learn from each other, appreciate each other and how we see the Holy Spirit in each other. It’s a form of ecclesial learning. On a more jocular level, we can see that the Roman Catholics with their Irish background in Australia and the Lutherans with their German background can appreciate each other’s communities at least from the level of the production of quality wine, especially from the Barossa Valley! But also, again perhaps on a superficial level, I noticed this morning at the Morning Prayer in St Stephen’s Lutheran Church just how wonderful hymn singing happens in the Lutheran Church. The Lutheran’s can certainly sing the hymns in a way that the Roman Catholics can learn a lot from! Perhaps more on a serious level, there would be many future hopes from all of us for the decades ahead. Two come to my mind immediately. First of all, I think we should take seriously the advice of Pope Francis in regard to expressing our growing union towards each other in a practical ecumenism. We learnt today that our combined histories in this fair land of Australia have united in our shared apostolates with Aboriginal and Torres Strait Islanders in this land. This is something to be encouraged perhaps in the future. Can we do some things together? Can we stand alongside our first Australians who are still the most impoverished people in this land? There is also the area of education. And also we learnt today from the beautiful presentation of Caritas and the Lutheran World Service of how we can stand alongside those on the periphery in the world and work together in a practical ecumenism. Long may it continue and grow! Secondly I am delighted to see today at our vespers young people from a local Lutheran school. We must reach out to the new millennial Roman Catholics and Lutherans of Australia and pass the baton of ecumenism onto them. Sometimes we feel that young people today aren’t too fussed about the burdens of history. But the burden of history does affect us in the present and we need to learn from each other so that these works of ecumenical coming-together can continue in a new generation without lapsing into the mistakes of the past. The passing of the ecumenical baton is a real priority! Perhaps, this could take place with working with our young people in regard to our shared mystical theology. We share so much from the spiritual point of view. Perhaps combined Christian meditation could be advanced in our midst. Also young people always have a great priority for works of justice. Can we do even more with the young people in regard to practical ecumenism and evangelisation? The carrying on the mission of Jesus Christ can never be imposed. We are not proselytises. It must always be proposed to newer generations. The fragrance of the Gospel of Jesus Christ we encounter with Jesus is the greatest joy that we can share, not only with young people but working alongside young people to those that have never heard yet of the liberating freedom of Jesus Christ as saviour and Lord. Let us now continue with our evening prayer but let us be reminded always that all is grace. All is gift from God in Jesus Christ. Ultimately there is only Jesus, always Jesus, forever Jesus.